(17789, Joyce Nadine Odle Farley Collection, OHS). (2435.A, Bella Gibbons Collection, OHS). (8470.79, Grant Foreman Collection, OHS). (2435.B, Bella Gibbons Collection, OHS). When Oklahoma became a state in 1907, approximately twelve million of its acres were covered with forests. 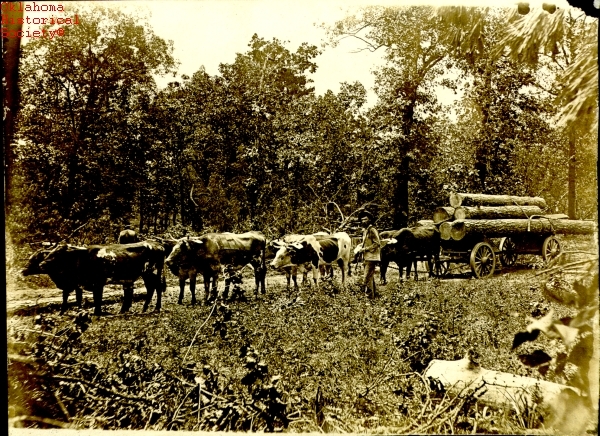 Particularly in the southeastern part of the state, large stands of virgin shortleaf and loblolly pines, along with valuable bottomland and upland hardwoods, were immediately attractive to migrating lumber enterprises already active in Arkansas and other southern states, and the lumber industry grew. 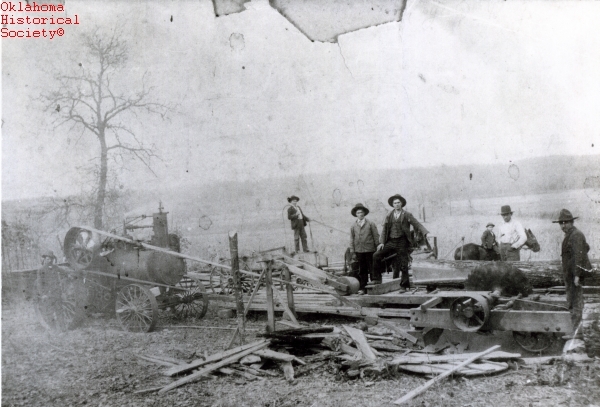 Early forest-industry pioneers in Oklahoma were the Dierks brothers. They had owned and operated lumberyards in Iowa, Nebraska, and North Dakota beginning in 1880. In 1895 Dierks Coal and Lumber Company was formed in Lincoln, Nebraska, moving to Kansas City, Missouri, in 1897 and incorporating in 1898. The company decided to begin manufacturing lumber soon after incorporation and purchased a sawmill in De Queen, Arkansas, and a planing mill at Petros, Indian Territory (near Heavener). The firm also began acquiring large acreages of timberland in McCurtain County and southwest Arkansas. After the De Queen Mill burned in May 1909, Dierks decided against rebuilding the mill in favor of moving to Oklahoma. Following railroad construction, the mill site was established along with a company town named Bismark (now Wright City) in McCurtain County. A separate corporate entity called the Choctaw Lumber Company was formed for Dierks's Oklahoma operations. 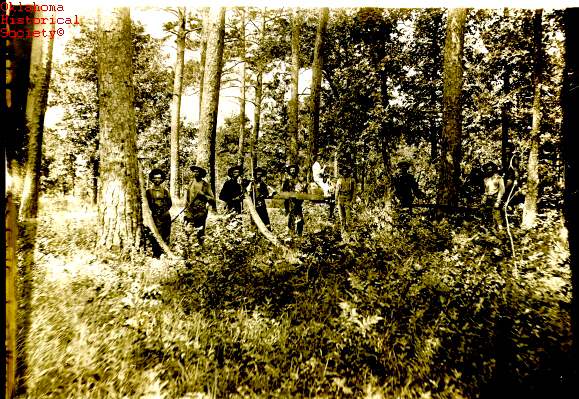 The first log went to the saw July 13, 1910. This mill and another pine mill in Broken Bow gave Choctaw Lumber Company the ability to produce nearly 250,000 feet of pine lumber daily. A hardwood sawmill owned by the company, also in Broken Bow, was capable of producing 60,000 feet per day. The Choctaw Lumber Company also owned and operated many miles of railroad from Valliant, Oklahoma, to De Queen, Arkansas. Their Texas, Oklahoma and Eastern line had connections to other railroads at both locations. The company's activities and holdings heavily influenced development of McCurtain County's agriculture and infrastructure. Choctaw Lumber Company later became Dierks Forests, Inc., which in September 1969 was acquired by Weyerhaeuser Company of Tacoma, Washington. Weyerhaeuser became the largest timber company in Oklahoma, although Georgia Pacific, another large corporation, has figured prominently in Oklahoma's industry. Roundwood (lengths of cut trees generally round in cross section) products are classified as sawlogs (for lumber), veneer (for plywood generally), and pulpwood (for paper). These products are further classified as softwood (southern yellow pine in Oklahoma) and hardwood (deciduous species, principally oaks here). Pine sawtimber dominates lumber production in Oklahoma, both in volume and economic importance. Most of this is processed in the larger corporate mills in the southeast. Production of all classes of products has fluctuated because of market conditions but has generally trended upward from 1955 to 1996. For example, pine sawtimber production ranged from a low of ten million cubic feet in 1955 to a high of just over forty-five million cubic feet in 1996. Hardwood sawtimber production went from three million cubic feet in 1955 to a high of around nine million cubic feet in 1984, dropping then to about seven and one-half million cubic feet in 1996. McCurtain County leads Oklahoma in roundwood products, with nearly three times the production of second-place Pushmataha County in 1996. Le Flore, Latimer, and Haskell counties make up the rest of the top five, in that order. Twenty-five of the sixty-eight sawmills counted by the USDA Forest Service in 1996 are concentrated in those five counties. The northeastern part of the state had twenty-one sawmills at the 1996 count, but these are smaller capacity, and production is primarily devoted to hardwood. A number of mostly small, independent sawmills in the central and western parts of Oklahoma are devoted to traditional hardwoods and eastern red cedar. A recent development in the Oklahoma forest products industry is the formation of associations of independent primary and secondary manufacturers dedicated to the advancement of this segment of the industry. The Oklahoma Redcedar Association, formed in 1991, and the Wood Industry Association of Oklahoma, founded in 1998, are examples of this trend. Many of the pine natural forests and plantations in the southeastern part of the state are well managed and should supply this segment of the industry with sustainable quantities of roundwood. As a result of poor management many hardwood forest stands in the northeast are in poorer condition. Improving utilization and markets for lower quality hardwoods and eastern red cedar should be a major challenge to the smaller forest-products businesses in northeastern and central Oklahoma. Louis Coleman, ed., McCurtain County: A Pictorial History, Vol. 2 (Idabel, Okla.: McCurtain County Historical Society, 1999). Michael Howell and Tony Johnson, Oklahoma's Timber Industry: An Assessment of Timber Product Output and Use, 1996, USDA Forest Service Southern Research Station Resource Bulletin SRS-30 (Asheville, N.C.: USDA Forest Service, 1998). Elbert L. Little, Forest Trees of Oklahoma (Rev. ed. ; Oklahoma City: Oklahoma Department of Agriculture Forestry Services, 2000). Elbert L. Little, My Sixty-five Year Study of Progress in Managing Pine-oak Forests (Pinus echinata) in Southeastern Oklahoma: A Photographic Summary (Oklahoma City: Oklahoma Department of Agriculture Forestry Services, 1997). James S. Rosson, Jr., Forest Resources of East Oklahoma, 1993, USDA Forest Service Southern Research Station Resource Bulletin SRS-58 (Asheville, N.C.: USDA Forest Service, 2001). Laurence C. Walker, The Southern Forest, A Chronicle (Austin: University of Texas Press, 1991). Wright City Publication Committee (Ted Thompson et al. ), Wright City Oklahoma, 1910–1985 (Broken Bow, Okla.: Broken Bow News, 1985). 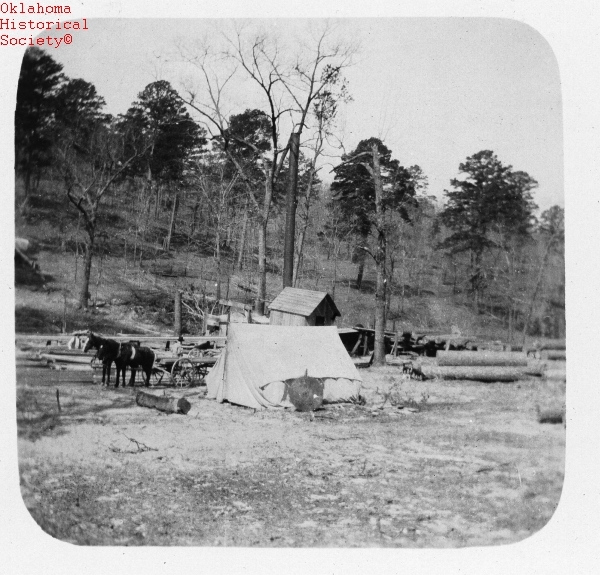 William G. Ross, "Forestry," The Encyclopedia of Oklahoma History and Culture, https://www.okhistory.org/publications/enc/entry.php?entry=FO024.